This week my wife bought a copy of Descent: Journeys in the Dark, Second Edition. This short review outlines the generally positive feeling that the game gave me (at least as Overlord) and one or two concerns that arose from the other player's reactions. This is a high-quality board game from Fantasy Flight Games. It draws inspiration from the classical dungeon adventure of D&D fame, pitting a team of adventurers against the denizens of various short quests. The biggest break with roleplaying, however, lies with the fact that the Hero players (who play an adventurer) are in direct competition with the Overload player (who has all the critters and lots of power). 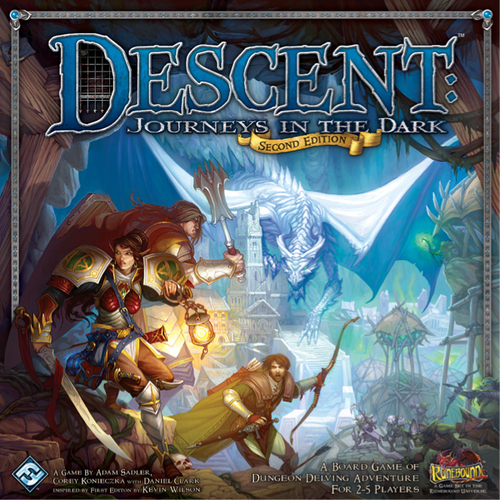 This makes Descent a board game, not a roleplaying experience. Costing around £50-55, what do you get for your money? Impressively, quite a bit. Firstly there are 39 miniatures, of which 8 are heroes and the rest are groups of monsters. Chunky dragons and elementals rub shoulders with Goblins and zombies. These are in a reasonably detailed plastic which provides three colours - grey for heroes, white for basic monsters, and red for "Master" monsters (aka bosses). No assembly was required, although I was slightly disappointed that my Master Zombie model had become bent in the box, leaving him perpetually leaning back (as if drunk) despite attempts to bend him upright. Next is all the card. Hard-stock board sections, each numbered and double-sided. Lots of chunky counters from the same cardstock. Very little wastage from the frames. The boards are all marked with squares for movement, although my colour-blind eyes found seeing the lines awkward on some sections. There are also a myriad of playing-card sized reference cards and various decks for use in play. From the Overlord Deck (with which I am becoming familiar) through to the Monsters Cards, these are all beautifully illustrated. There is also a smaller-sized card used for Condition Cards and other, smaller decks. At first we were worried at the volume of card types but, with play, realised that relatively few are in use at any given time: you will be swapping Act I decks for Act II decks later in the campaign (should you use it) and you don't need everything all of the time. There are eight heroes (archetypes), 8 character classes (two per hero archetype) and many choices to be made should you want to play through a campaign. Mention of the campaign means it's worth mentioning that, in addition to a very easy-to-read and well-constructed rulebook, you also receive a Quest Book. This contains 20 quests, of which 16 are useable as one-off games. Together the 20 quests comprise a campaign, playing 9 of the quests in a sequence through which the outcome of each quest affects the later events in the campaign. Of note is also the fact that the cards come pre-sorted in ziploc bags. We liked this. Oh, and there are special custom dice. It's simple. Heroes go first, in any order the players choose. Then the Overlord goes. Heroes and monsters get two actions per turn. Heroes can repeat actions (including Attack) but monsters can only Attack once. You can move, attack, use skills and abilities, help injured friends and many other useful options exist. You roll dice to resolve most actions. Each quest is a mini-mission. A couple of quests only have one encounter but most have two. You play through the encounters and seek to achieve your goals - Heroes and Overlord have different objectives each time. In the first game, for example, the Overlord needed to get 5 Goblins to escape the evil Heroes... while the Heroes were seeking to kill the Ettin... which they did very quickly in our case. You can play at a basic level, treating each quest as a one-off game. You can play one-offs but increase the power-level of the game by one or two notches. Or you can play the campaign. This is a fast, easy-to-run and well-ordered system of play. We liked it. After one game we decided we wanted to keep the heroes and develop their powers. The campaign was obviously the way to go. After each quest there is a brief Campaign phase. The heroes return to the town, gain experience points to spend on improving their abilities (all chosen from their Class deck), spend cash earned in the Shop (all from a card deck), and choose their next quest. The Overlord also gains XP and can upgrade their own Overlord Deck, choosing from both universal cards and those belonging to one of three Overlord Classes. Once prepped, the heroes travel to their next quest. There is a map with travel encounters possible (again, through the use of a deck of cards). This took but a minute to resolve when we played and is very slick. Once arrived, the heroes enter the next quest's first encounter. You set up, place the models and set to. It's quite easy and the Quest book gives the Overlord a lot of choices to consider. We had a good session with two quests, for a total of three encounters, played over around 4 hours. The campaign promises some 20+ hours of game time over multiple sittings. What impresses me is the combinations of play which means that there is considerable re-playability for the campaign. Each of the eight heroes has two classes to choose from; the Class Cards can't all be bought over the 9 quests that form the campaign, so you have to make choices; the Overlord is customising their own deck and choosing different monsters each time they run a quest; and so on. There are enough choices and random elements to guarantee that no two quests will play the same way. Tactically the game is challenging. Players have to work together and decide how to tackle each part of the quest. The Overlord gets to throw spanners into their plans. Playing cards from the Overlord Deck essentially either boosts the monsters or disrupts the heroes. My favourite card is "Tripwire". Of concern for one player was the sense that the game favours the Overlord somewhat. I think that, if this perception is correct (and it might not be) that would be acceptable because the game should be challenging for the Heroes... especially as they form a team with ever-growing powers. But then, I would say that... I played the Overlord. Is there enough variety in the monsters? Probably. There aren't too many different types but they do upgrade in Act II of the campaign, and there are basic versions as well as bosses. In a way, too many monster choices might make for fiddly play. As Overlord I had enough choices and variety in our first two quests... and the Heroes quickly worked out how to defeat them. My largest disappointment is that the Lieutenants, special characters used by the Overlord in some missions, didn't come with miniatures. They are represented by tokens. I know that eight or so extra models would be expensive but it did detract from the high-quality of the rest of the creatures. It would be nice to be able to place them as miniatures, just like everyone else. Overall... well, I was impressed. My wife and friends seemed to have a good time. We are a competitive bunch, though, so the Overlord versus Heroes vibe did get intense... which is not always a good thing. It's a high-quality board game which, for me, rivals Warhammer Quest (one of the greatest games ever designed) but doesn't quite pip it. Descent is very, very playable and a game that I hope to be coming back to sooner rather than later. Sounds great - wished I'd been involved. These board games are sure getting expensive though - But I suppose that is the case with small games, trying to get a foothold.